Erhun Oztumer in action for Posh against Doncaster. Photo: David Lowndes. League 1 report: It’s a sign of how far Peterborough United’s stock has fallen that a goal-less draw at home to a Doncaster team below them in the League One table is seen as a decent result. But in the context of what has been seen in recent weeks Posh will take this smallest of mercies. The form guide today (December 28) certainly favoured Rovers who stretched their unbeaten run away from home to eight matches, even if they failed to inflict a fifth straight League One defeat at home on Posh - that would have equalled an unwanted club record for Darren Ferguson’s run. Ferguson will probably be breathing a little easier tonight. There’s been no suggestion from chairman Darragh MacAnthony that his manager has ever been one bad result away from the chop, but if Posh had repeated the Boxing Day debacle at Chesterfield in this game, the clamour for a change would have been deafening. Anyway Ferguson was confident after this 0-0 draw to talk openly about his Posh plans for 2015, while gently rebuking those fans who voiced their dissent at Chesterfield during the game. Clearly he believes that winning more promotions than any other Posh manager in history is deserving of more patience from those who treat social media as a virtual protest march. Ferguson tested that patience today by installing Ricardo Santos, a 19 year-old from Thurrock, at right-back rather than Michael Smith, a player on the cusp of a Northern Ireland place at the start of the season. It was an obvious mistake that was rectified at half-time with obvious results. The Posh improvement after the break couldn’t just be placed at Smith’s feet, but he has energies, ball skills and a defensive awareness that Santos does not yet possess. Smith joined in happily with attacks, but also defended strongly, most notably with a couple of key headers during a five-minute set-piece siege from Doncaster midway through the second period. Christian Burgess and Michael Bostwick, today’s central defensive partners, also coped well during that spell. This was a big improvement on the Chesterfield capitulation even though Harry Forrester was unlucky not to claim the winner for Doncaster with a terrific free-kick 10 minutes after the re-start that rattled the crossbar. This contest was worthy of the classic ‘game of two halves’ cliche. The first period was awful as Doncaster missed a trick by not steaming at fragile opposition from the start. The visitors kept possession easily enough, but their build-up was laboured and playing just one striker against Posh is nearly always a mistake. Doncaster were the better side though as Posh looked nervy with few players looking like they actually wanted to receive the ball. 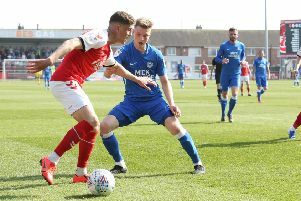 The recalled Marcus Maddison, Erhun Oztumer and Joe Newell, who played at left-back in this game, were the exceptions. Only when Maddison clipped a 20-yard shot over the crossbar following a clever free-kick routine did Posh threaten a goal, but it was a different story after the break when both teams remembered they are working in the entertainment industry. Both sides enjoyed spells of possession which stretched opposing defenders. Posh ‘keeper Ben Alnwick made a fine stop to thwart Enda Stevens (Newell bravely blocked the follow-up) and Doncaster ‘keeper Sam Johnstone got down well to keep out a fierce shot from substitute Nathaniel Mendez-Laing. Luke James came to the fore for Posh during their good spells. He outstripped the visiting back four on a couple of occasions, but couldn’t quite locate strike partner Aaron Mclean. It was the same on the other flank as Newell regularly found space without finding an accurate pass - most notably two minutes from time, following excellent play by Mendez-Laing, when a handful of Posh players were waiting in good shooting positions. The ball wouldn’t fall for Posh in the penalty area. James fired one shot against Johnstone’s legs with the rebound just falling out of Mclean’s reach and when there was a favourable ricochet, Jack Payne hooked a difficult bouncing ball over the crossbar with his weaker left foot and Bostwick saw a header from a corner blocked close to the Doncaster goal-line. There was also a late shout for a penalty as Luke McCullough appeared to hold James. It was an optimistic appeal, but the way this referee officated anything was actually possible. Gary Sutton was an appalling pedant, keen to slow the game down and making some laughably inaccurate decisions. That’s something Ferguson has regularly been accused of in recent weeks. Sometimes it’s been justified on other occasions it hasn’t. The manager still needs a strong second half of the season from his team. This was much better in terms of commitment and attitude, but Posh haven’t scored at home in three matches since they re-named their stadium and that is certainly not an excuse for an immediate New Year celebration. Posh: Ben Alnwick, Ricardo Santos (sub Michael Smith, 46 mins), Michael Bostwick, Christian Burgess, Jack Payne, Harry Beautyman, Joe Newell, Marcus Maddison (sub Nathaniel Mendez-Laing, 77 mins), Erhun Oztumer, Aaron Mclean (sub Conor Washington, 77 mins), Luke James. Unused substitutes: Jermaine Anderson, Harry Anderson, Joe Day, Kyle Vassell. Doncaster: Sam Johnstone,Reece Wabara, Luke McCullough, Andy Butler, Enda Stevens, Harry Forrester (sub Billy Whitehouse, 90 mins), James Coppinger, Dean Furman, Paul Keegan, Marc De Val (substitute, Harry Middleton, 34 mins), Theo Robinson (sub Curtis Main, 83 mins). Unused substitutes: Marko Marosi, Jamie McCombe, Liam Wakefield, Jack McKay.